Bilgisayarımda virüs var. Bilgisayarıma formatda atmam lazım. Elimde format cd yok. Elimde boş cd var 1 tane. Bu CDye format dosyası .iso yu yazdırıp format atmam gerek. Ama bilgisayarım virüslü. Format cd'sinde sıkıntı olabilir diye düşünüyorum. Siz ne düşünüyorsunuz ? Sadece kurulum yapıp, win7 loader ile orjinalleştirip temiz kurulum yapmayı planlıyorum. Ama bilgisayarın şuanki hali endişelendiryior. (13-07-2016, Saat:16:49)Relay Adlı Kullanıcıdan Alıntı: Merhabalar. Virüs varsa sanal makineyide etkiler. Bir şey değişmez. Önce interneti kes. Sonra USB'yi tak bilgisayara. Format dosyaları olan USB'yi. Bios'a gir Hard Disk'ten değil USB'den başlatı işaretle Bios'tan çık kendine res atacak bilgisayar. İnterneti kes en önemli olanı. Bulursun format USB'si internet kafelerden. Hayırlı forumlar. - Bende usb var zaten. USB iso yazdırma programı (örn) rufus. indireyim bilgisayarda dursun. - Ardından iso dosyasını indireyim. - İndirdikten sonra interneti keseyim. - Flasha yazdırayım, format atayım usbden. - Tekrar iso dosyasını indireyim. - Bu sefer CDye yazdırayım .iso dosyasını. - CD'Den tamamen temiz kurulum yapayım. 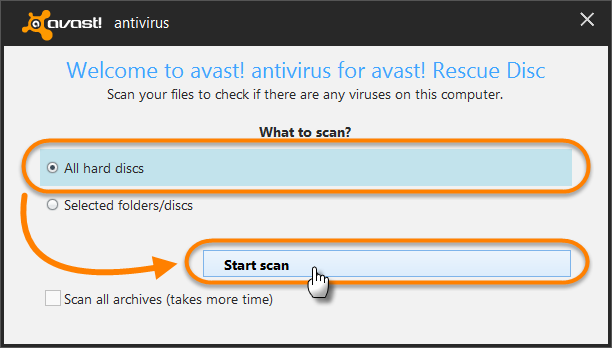 Another malware-free Windows computer with Avast 2016 installed. An empty USB drive with capacity 500 MB or higher (Preferred method). Computers manufactured around year 2000 may not boot from USB drive. 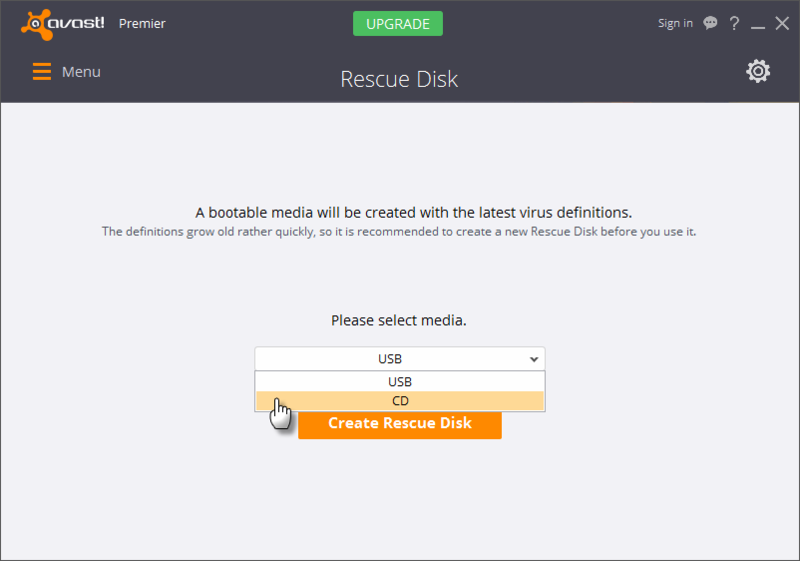 In this case you should use the Alternative method to create Rescue Disk on a CD. From the main menu, select Tools and then Rescue Disk. Insert an empty USB drive into the USB port and select USB from the drop-down menu. Then click Create Rescue Disk... ...and select the drive letter indicating your USB drive. If asked, confirm Yes to erase content of selected USB drive. Select CD, then Create Rescue Disk ... ...then click browse to save the ISO file (CD image) on the computer. Select the location and click Save. Then click Create ISO. A progress bar appears while your Rescue Disk is being created. When the Rescue Disk image is complete, click OK.
A progress bar appears while your Rescue Disk is created. When the Rescue Disk image is complete, click OK. The ISO file is saved to your computer and ready to burn to a CD. Next burn the image on a blank recordable CD using a CD/DVD-writer software. On Windows 7 or later you can use the built-in Windows Disc Image Burner. After creating a Rescue Disk image you can boot the computer containing malware using the external USB (Preferred method) or CD (Alternative method) drive instead of the internal hard drive. 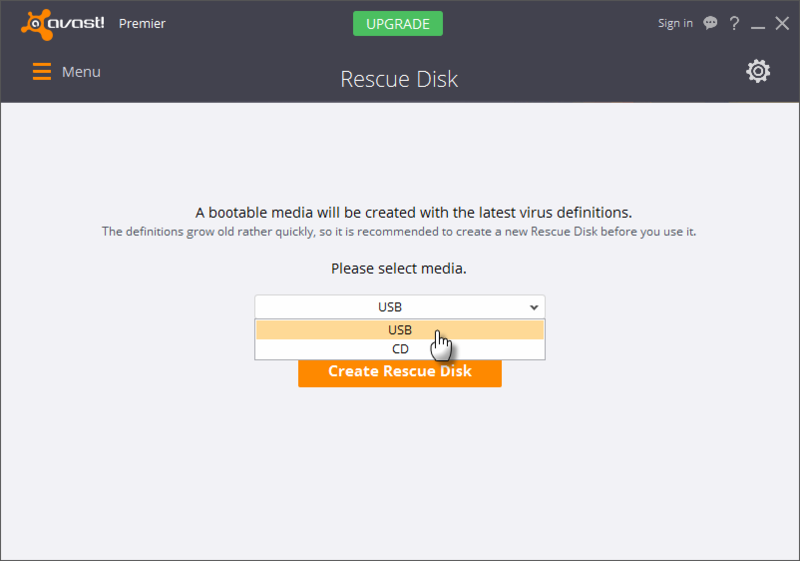 Turn off the computer and insert USB drive with Rescue Disk into the USB port. Insert CD with Rescue Disk into CD/DVD drive on the computer and turn it off. Turn on the computer to be scanned. As soon as it is powered on, press the appropriate key to enter the Boot Menu. Because of the wide variety of computer and BIOS manufacturers, there are numerous ways to access the Boot Menu. The keys that are commonly used are Esc, F12 or F11. Some computer models or manufacturers also use other keys such as F10, F9, F8 or F5. Once you determine the proper key to access the Boot Menu, restart the computer again and immediately start tapping that key. When you have selected to boot from the appropriate external media, a message appears instructing you to press any key. This action starts Rescue Disk. If you cannot access the Boot Menu, refer to the computer's documentation on the manufacturer's website, or try to contact manufacturer's support. Computers manufactured around year 2000 may not boot from USB drive. 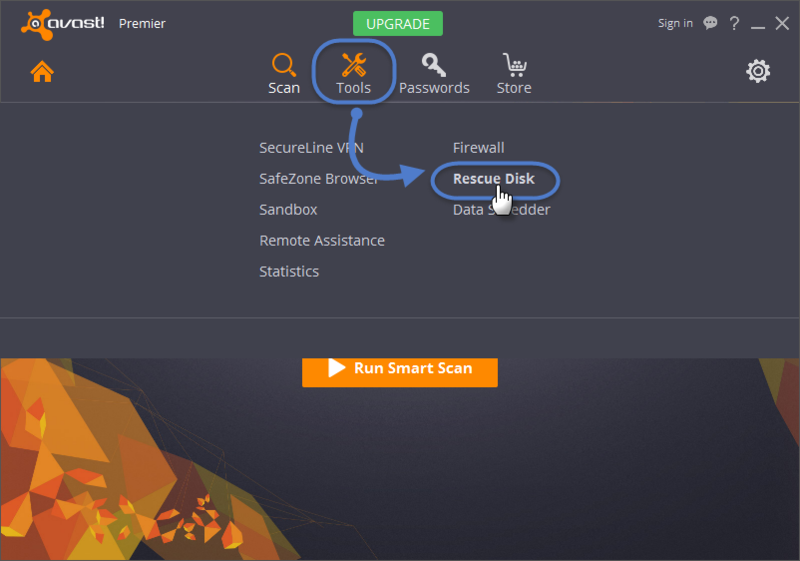 When Rescue Disk starts up on the computer, it is ready to scan for malware. All hard discs - Scan the entire computer. Selected folders/discs - Scan only specific folder(s) or disc(s) on the computer. Click Change to select the folder(s) or disc(s) to scan. Click OK.
Click Start scan. A progress bar appears. When scanning is finished, a scan report appears. Any threats found are listed in the report, ...and also in the results screen. 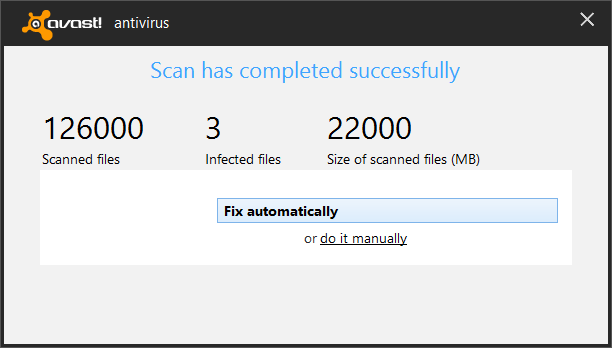 After scanning the computer Rescue Disk notifies you of any threats found. When threats are found, two options are available. Rescue Disk tries to remove the malicious code from all infected files, while keeping the rest of each file intact. 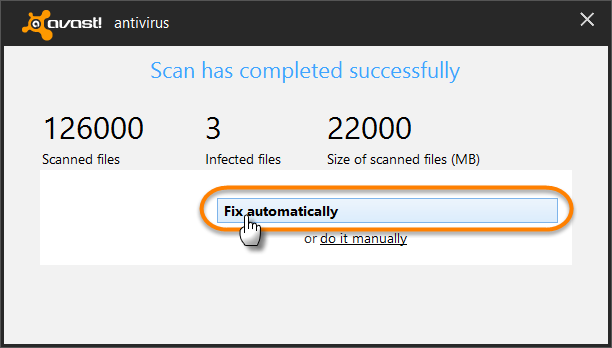 If it fails to repair any files, the files will be automatically deleted from the infected computer. When you select do it manually you can select threats to repair or delete. Fix automatically - Remove only the malicious code from the selected files, while keeping the rest of each file intact. Threats that cannot be repaired are automatically deleted. Repair selected - Remove only the malicious code from the selected files, while keeping the rest of each file intact. Threats that cannot be repaired should be manually deleted. 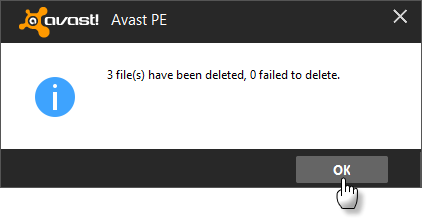 Delete selected - Permanently delete selected files from the computer. When completed a confirmation appears. Click OK. 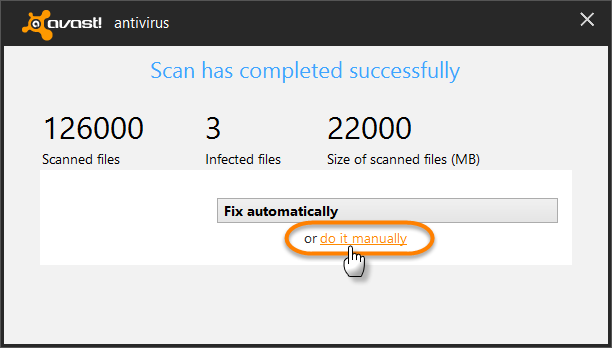 If you selected Scan all archives and a threat was found in an archive, you can also Delete infected archives. 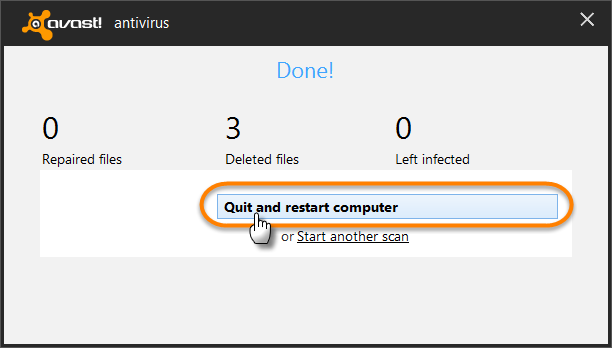 When completed click Continue, ...and select Quit and restart computer to exit Avast Rescue Disk. When the computer restarts you can remove the external USB drive/CD containing Rescue Disk from your computer. cok sağol capos. bu avastın rescue disk 'i tam tarama, güvenlik koruma sağlayacakmı ? açılışta tarama yapıyor tamamda, avast pek tavsiye edilmiyor. (14-07-2016, Saat:01:53)Relay Adlı Kullanıcıdan Alıntı: cok sağol capos. bu avastın rescue disk 'i tam tarama, güvenlik koruma sağlayacakmı ? açılışta tarama yapıyor tamamda, avast pek tavsiye edilmiyor.